British Prime Minister Gordon Brown on Wednesday told Parliament that police need more time to question terror suspects in complex cases beyond the 28 days currently allowed before they are charged or released. Brown put various options forward but did not make a specific proposal for allowing detention beyond the current limit. He said another proposal, to allow police to question suspects after being charged with offenses, would minimize the number of exceptions to the 28-day standards. 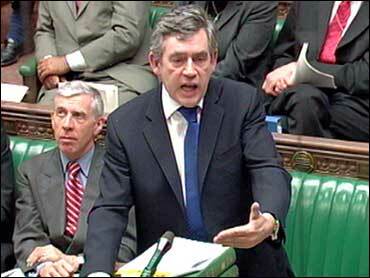 Brown also announced a review into the use of wiretaps in court cases, a practice banned in Britain. In addition, he proposed the creation of a unified border police force combining the work of immigration, customs and visa agencies. He said there had been 15 attempts to attack Britain since the Sept. 11, 2001, attacks on the United States and that police now needed longer than a limit of 28 days to question suspects before they are charged with an offense or released. The British leader presented four options to be considered by politicians, police and civil rights campaigners. "Our country — and all countries — have to confront a generation-long challenge to defeat al Qaeda-inspired terrorist violence," Brown told the House of Commons. One option would include using current state of emergency laws to grant police a maximum of 58 days to question suspects, Brown said. Another would allow police to apply to judges for extensions beyond 28 days. Officers would need to seek permission every week, and details of the case would need to be provided to Parliament, Brown said. Britain, France and Germany will form a joint anti-terrorism council to share experience and examine ways of tackling homegrown extremism, Brown said. He said Britain would use a 70 million pound ($144 million) fund to pay for community projects in areas where young people are at risk of falling prey to extremist religious preachers. The proposed changes follow failed attacks last month, when a pair of luxury cars packed with gas cylinders and nails were found in central London and two men crashed a Jeep Cherokee loaded with fuel canisters and gasoline into security barriers at Glasgow airport's main terminal, setting it ablaze. In 2005, lawmakers rejected the government's bid to allow police to detain suspects without charge for 90 days, forcing it to accept the lower limit in former prime minister Tony Blair's first parliamentary defeat. Six suspects have been questioned for 28 days since the 28-day rule was introduced last year — two of whom were charged in connected with an alleged plot to down U.S.-bound airliners. A third man, Habib Ahmed, was charged by police in Manchester with keeping documents linked to terrorism and attending a terrorist training camp in Pakistan. The other three were released without charge, police said.